Star Wars has always been a popular hit with it's die-hard fans ever since the 1st show released even before I was born way back in 1977. 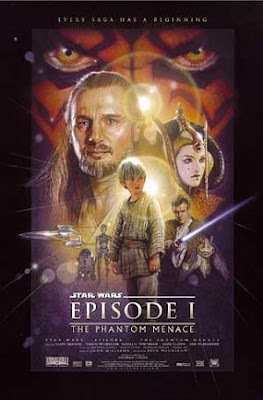 Now, they're re-releasing Star Wars Episode 1: The Phantom Menace in 3D and I was anticipating it with a lot of wow factor. For those who've been to space for the past few decades that have never heard of Star Wars movies, well, Star Wars: The Phantom Menace is about The Trade Federation blocking off routes around the planet Naboo under the guise of trade dispute while the real motive was actually to capture the planet under the orders of the evil Sith Lord Darth Sidious. Two Jedis, Qui-Gon Jinn and his apprentice, Obi-Wan Kenobi was sent over to negotiate with the Trade Federation to put a stop to this. But in their attempt to do so, they never got the chance and was attacked instead. This forces the 2 Jedis to escape to the planet Naboo and there they protect Queen Amidala from being captured into the hands of the Trade Federation. Reluctantly, Queen Amidala left her subjects of the planet Naboo to travel towards the senate at the capital planet of Coruscant in hopes of their help to end this. Along the way, their damaged ship had to make a landing at the planet Tatooine where they met Anakin Skywalker that has an unusual strong presence of the Force. I've watched this movie before way back when it was released in 1999 and it's quite an interesting show. However, the re-releasing of the movie in 3D was a big disappointment because I didn't see much 3D effect in the movie at all. They could've done more, especially the pod race moment. But unfortunately, I don't even know which part has the 3D effect in it. Totally not worth it. If you wanna watch the show, buy the DVD and watch it at the comfort of your own home. 3D is a waste of money and time. My rating: 2 out of 5. I like Star Wars . . . . .
haha, the theme song sounds like the Superman theme song and when I was young, I always mix them up.